Aston Villa defender Alan Hutton has signed a new three-year contract, seven months after being told he had no future at the club. The right-back did not play for Villa for more than two years before he was recalled at the start of this season. 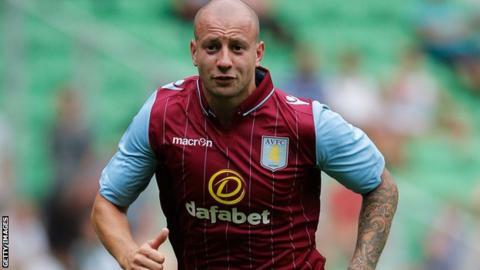 Manager Paul Lambert said in February that financial constraints meant Hutton was unlikely to play for Villa again. The Scotland international, 29, had loan spells at Nottingham Forest, Real Mallorca and Bolton during his exile. Hutton, whose previous contract was scheduled to expire at the end of this season, arrived from Tottenham for an undisclosed fee in September 2011. The defender made 31 league appearances for Villa during the 2011-12 campaign but was training with the club's development squad last season. Lambert said at the time: "We need to get the [wage] structure down. There's never been any fall-out." Hutton returned to competitive action on 16 August in Villa's 1-0 Premier League victory at Stoke.